The TRSSH series has been discontinued. Please contact our Temperature Engineering department for a viable replacement. Type 4 Terminals: Standard. Integral parts of the element are of high strength to resist bending during tightening of the wiring connections. 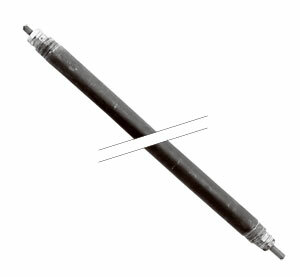 Type 4 is threaded extension of the cold pin. See terminal detail drawing in the Tubular Heater Overview section. Work Temperatures: See Tubular Heater Overview section. Bending: Customer’s minimum inside bending radius is 11/2". See bending requirements in the Tubular Heater Overview section.